Llandrinio is a small village and community in Montgomeryshire, Powys, Wales, close to the Wales-England border. It is situated on the B4393 road which travels from the village of Ford, Shropshire to Lake Vyrnwy. Llandrinio is home to 1,485 (2011 census) people spread over a reasonably large area. The village first had a large population growth by the addition of a council estate many years ago. Soon afterwards a local building contractor bought up some land and constructed a small street of pleasant detached properties, which was extended to add another 12 larger houses to the rear of the street. Another street of approximately 15 houses of ample size has since been added. The mainly Norman church of St Trunio is a grade II listed building. The village has a village hall, often used for car boot sales, and a playing field, which is used by the local cricket team and the junior football teams. The annual carnival has been opened by well-known faces such as actor Ryan Thomas. Nearby is a filling station with a Premier Stores . Also, there are many farms. The River Severn and Offa's Dyke both run through the village. The river is crossed by a stone bridge, which leads to the hamlet of Crew Green about a mile east of the village, and very close to English border. 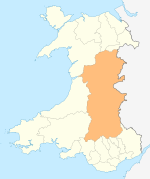 The village is also road linked to the towns of Welshpool, Oswestry, Newtown and Shrewsbury. An electoral ward in the same name exists. This ward had a population of 2,191 at the 2011 Census. ^ "Community population 2011". Retrieved 12 November 2015. ^ "Church of St.trunio, B 4393 (S Side), Llandrinio, Llandrinio". British Listed Buildings. Retrieved 15 December 2013. ^ "Ward population 2011". Retrieved 12 November 2015. This page was last edited on 10 September 2018, at 09:48 (UTC).